Creates lifelike gumpaste daisies, dogwoods, sunflowers, ivy and calla lilies with the Wilton Flower Impression Mat. Imprint natural texture to create realistic gum paste flowers. This 2-piece set allows you to easily press lifelike details into your gum paste petals and leaves. 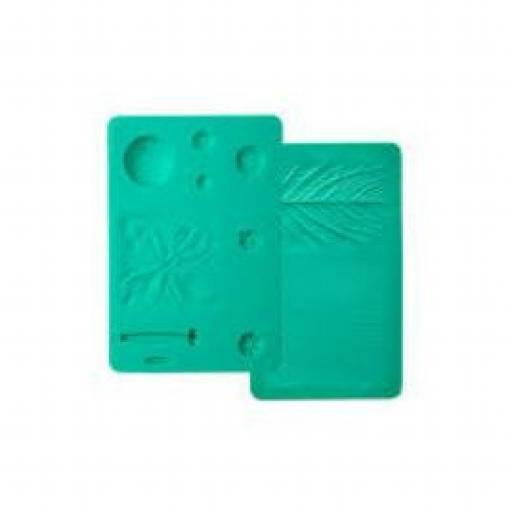 Create incredible texture and detail using these 2 silicone molds designed to mimic specific flower varieties. This set features: a daisy center, Gerbera Daisy Center, Sunflower Center, Dogwood Center, Ivy Leaf and Calla Lily mold, as well as a wire stem groove for wire leaf and flower assembly. Size molds approx. 11,4 x 16,5 and 11,4 x 19 cm.